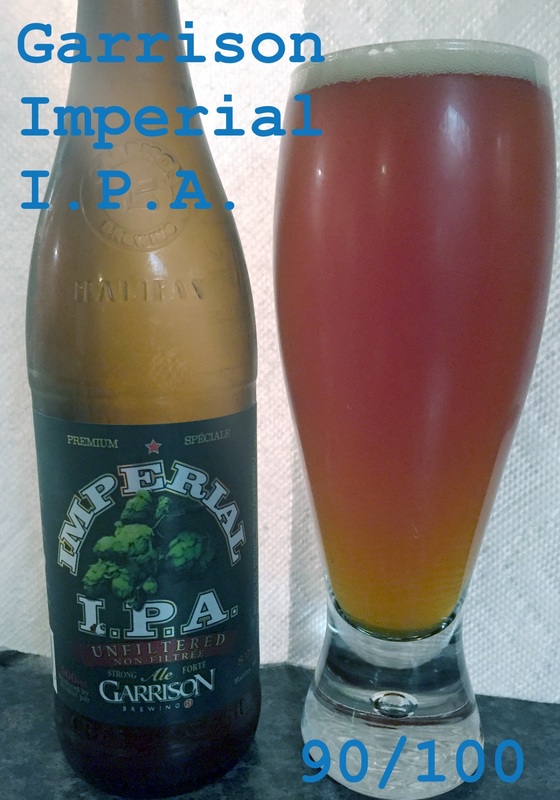 Garrison Brewing Co. – Imperial I.P.A. I am very happy that when I was in the Maritimes I grabbed some beer to bring back with me. There are so many out there that are fantastic and the brewery scene is growing every day. While I was back in Fredericton, NB two new breweries officially launched, Trailway Brewing Co and Grimross Brewing Co. I had the opportunity to try beers from both of them which I will be blogging about in the near future. Today though, I’d like to review Garrison Brewing’s Imperial IPA. The beer from them that I am excited to try is their Imperial IPA. Launched in 2007 at the Halifax Seaport Beerfest, this unfiltered double IPA comes in at a strong 81 IBU (international bitterness units) and is sold all year round. It uses Cascade, Amarillo and German Magnum hops balanced with 2-row pale, caramel, dextrin and Munich malts. I received word from Garrison yesterday that they have shipped a pallet to Manitoba, so I’ll be down at the MLCC looking for some soon! Appearance: Cloudy golden brown coloring with a good 1” head that retains well. Smell: Hoppy, citrus (lemon, grapefruit and some orange) with some sweetness coming through on the backend from malt (some caramel notes). Taste: Initial sweetness followed by some extreme hoppy bitterness with the citrus being front and centre. Good resinous hops that balance with the caramel notes from the malt and the sweetness from the alcohol. Long dry finish. Certainly does not disappoint on the hop front as they overpower the malts. Overall: Very strong double IPA. The hops chosen for this particular beer balance well together providing some good meshing with the choice of malts. Alcohol content is at 8% but not noticeable in this beer. Sweetness is great to start and balances well with the following Hoptacular assault. Overall a very strong double IPA. Do I like it: Yep. Big fan of this one. I love IPAs and the more bitterness the better for me. Double IPAs are at the top of my favorite styles when they can be well balanced and don’t tread into the sickly alcohol sweetness neck of the woods. This one had a strong IBU but was balanced well. The hops went well together and complimented each other rather than competing for the spotlight. I’ll be drinking this one again.